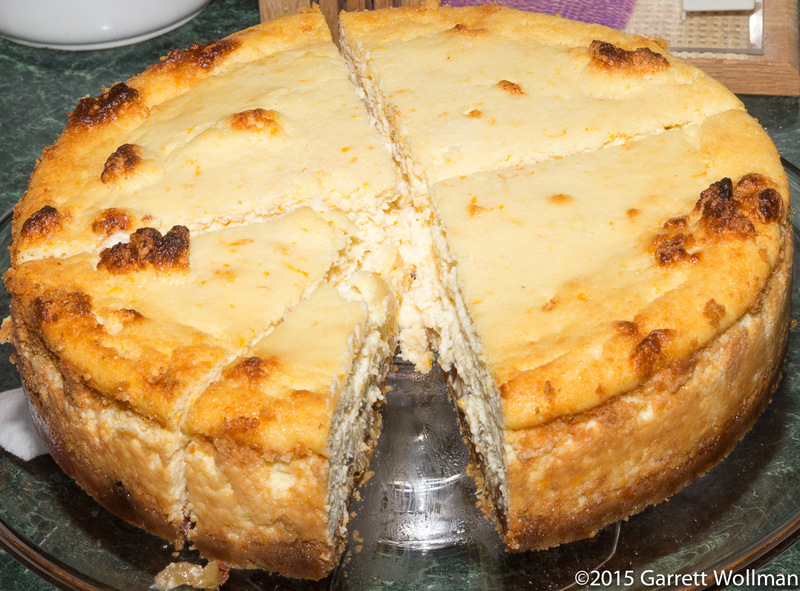 This was one of two cheesecake recipes I was originally considering making for my grandmother’s birthday back in August. 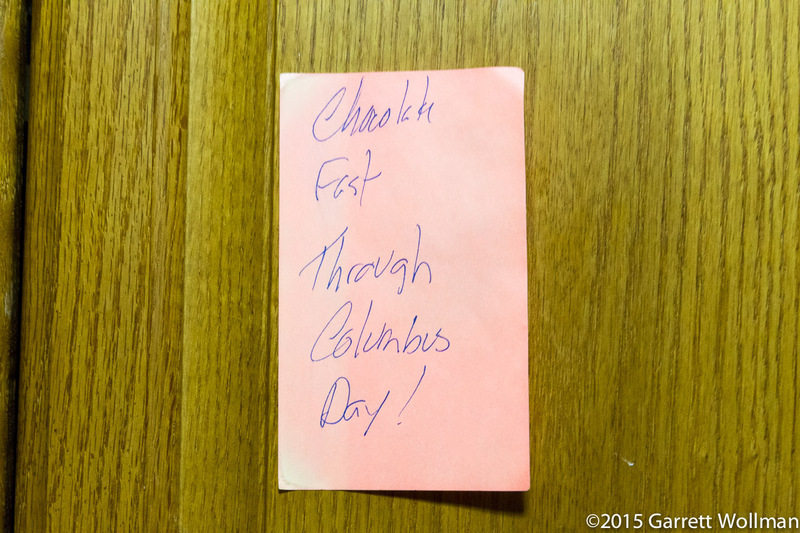 I put this one off indefinitely, but when my travel (or lack thereof) plans became a bit clearer, I added it to the schedule for the first weekend in October. Then I ended up scheduling a chocolate tasting on the Monday when I would normally have brought in my high-calorie weekend baking project, so I put it off until Wednesday. (Cheesecakes in general are really easy to make, although this one’s a bit more complicated than most, so I didn’t really need the whole weekend to do it.) It’s from Emily Luchetti’s A Passion for Desserts (Chronicle Books, 2003; p. 127) — and being in the “Autumn Desserts” section of the book it’s really more appropriate for October than August anyway. The second step involves rehydrating the dried fruit in a mixture of ¼ cup (60 ml) dark rum and ¾ cup (180 ml) water. 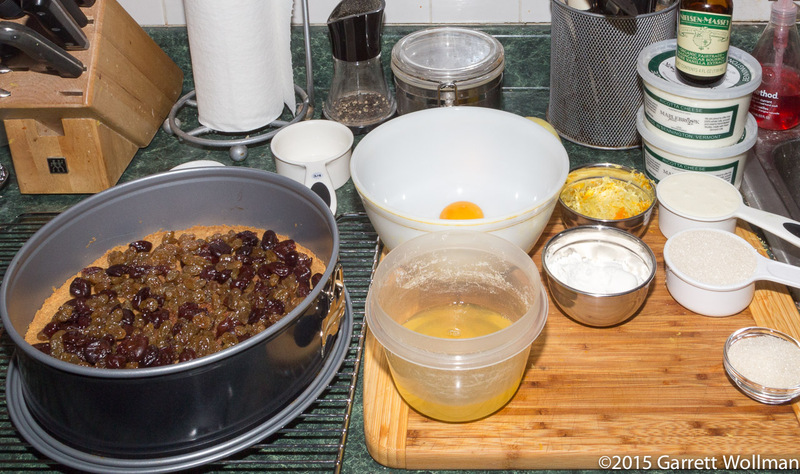 The fruit consists of ¾ cup each — apologies, I forgot to weigh them out — of golden raisins and dried tart cherries. These are boiled together in a small saucepan until there is no liquid remaining in the pan. The plumped-up fruit is then scattered over the graham-cracker crust. The recipe starts by beating the egg yolks and sugar together to the ribbon stage. 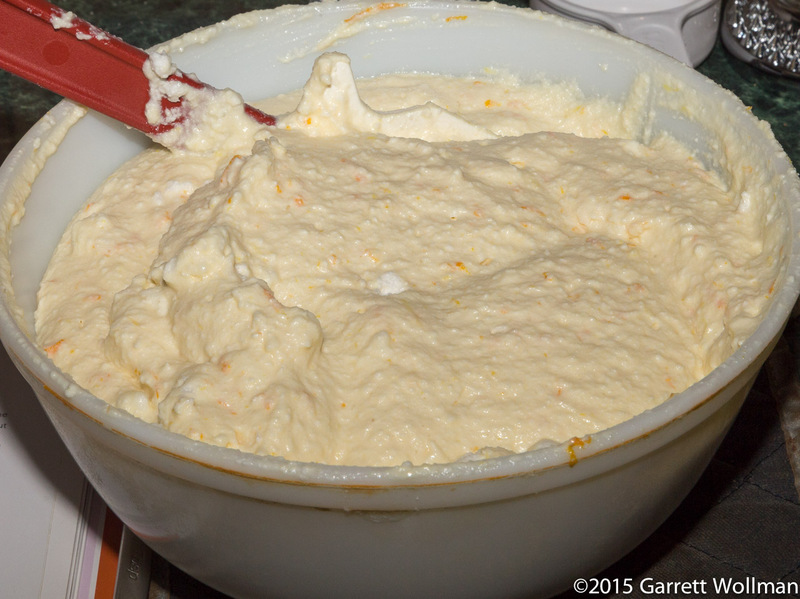 Then the cheese and the cream are blended in, followed by the flour, citrus peel, and vanilla. 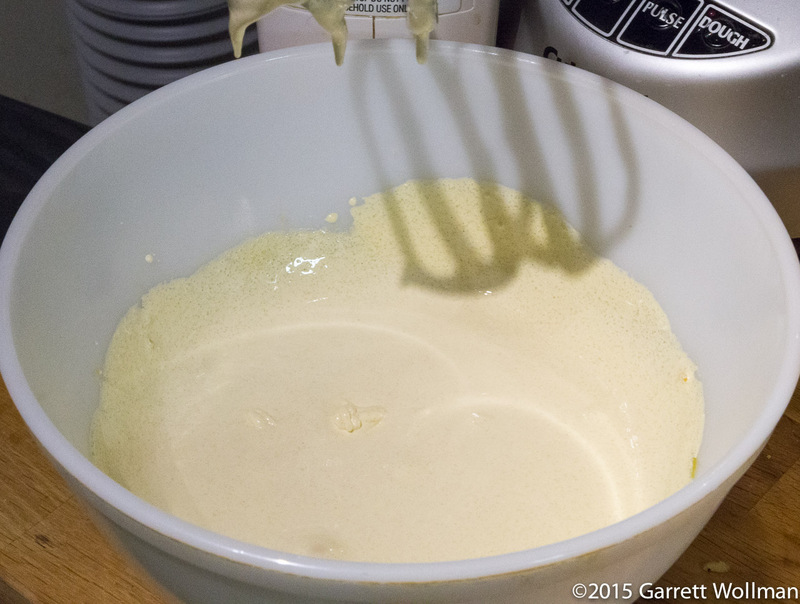 And of course it’s an egg-white foam, sweetened with the extra two tablespoons of sugar, which is used to lighten the texture of the cheesecake batter. 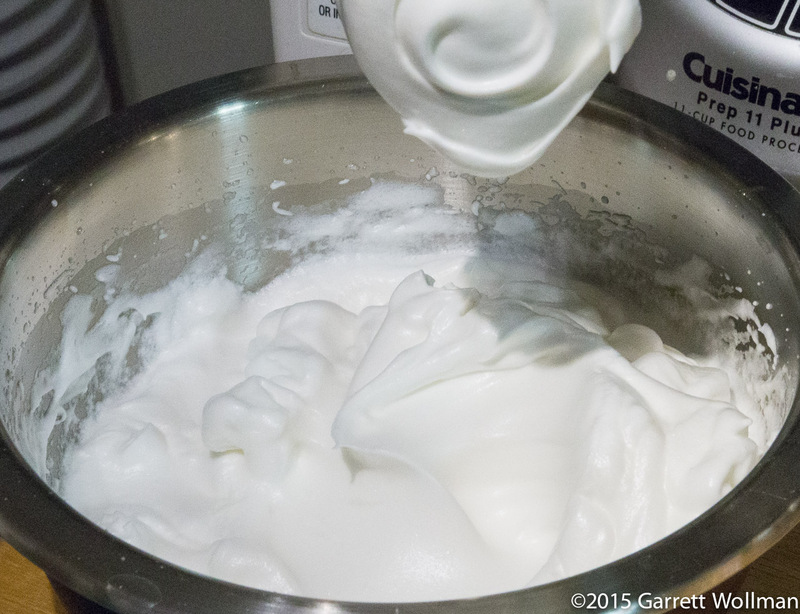 The egg whites are folded into the other mixture in the usual way, and then poured on top of the crust and baked (with the oven still at 350°F) for about 50 minutes. I think I overbaked the cheesecake a little — I was following the doneness criterion in the recipe, which is that a skewer inserted in the center should come out clean — but the darker spots are probably also places where the egg-white foam was not fully combined with the rest of the batter. 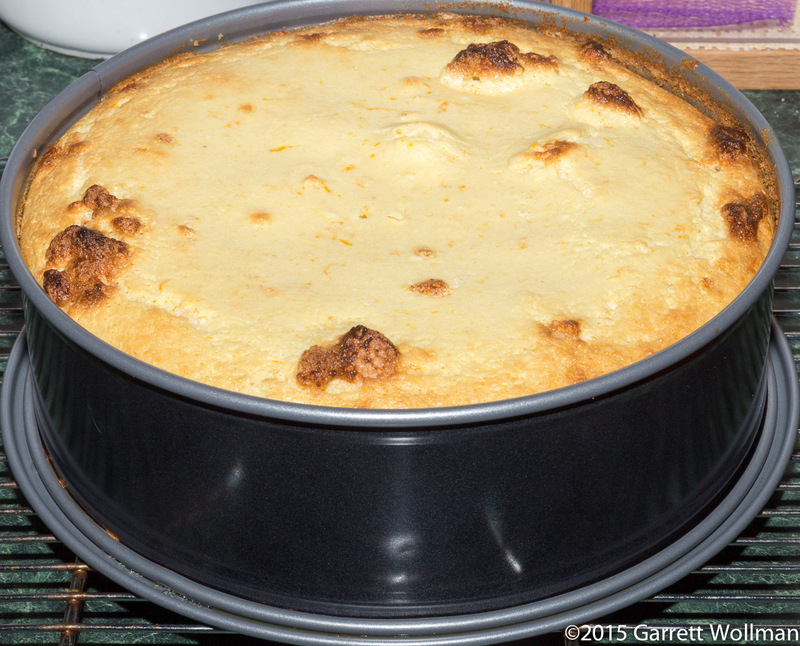 The cheesecake cools in the pan for quite a while, but it helps to run a knife around the inside of the pan after several minutes, so that the cake doesn’t stick to the pan and thus will settle evenly as it cools rather than leaving a raised rim. After the cake was sufficiently cool, I put it in the refrigerator to cool completely overnight. The next morning, I removed the ring from the pan and used my cake lifter to transfer it from the springform base to a glass cake stand for service. The stated yield of this recipe is 10 slices, but even as light as it is (compared to a traditional cream-cheese cheesecake) that results in a pretty horrifying calorie toll. I cut the cake in quarters, then quartered the quarters to get sixteenths. 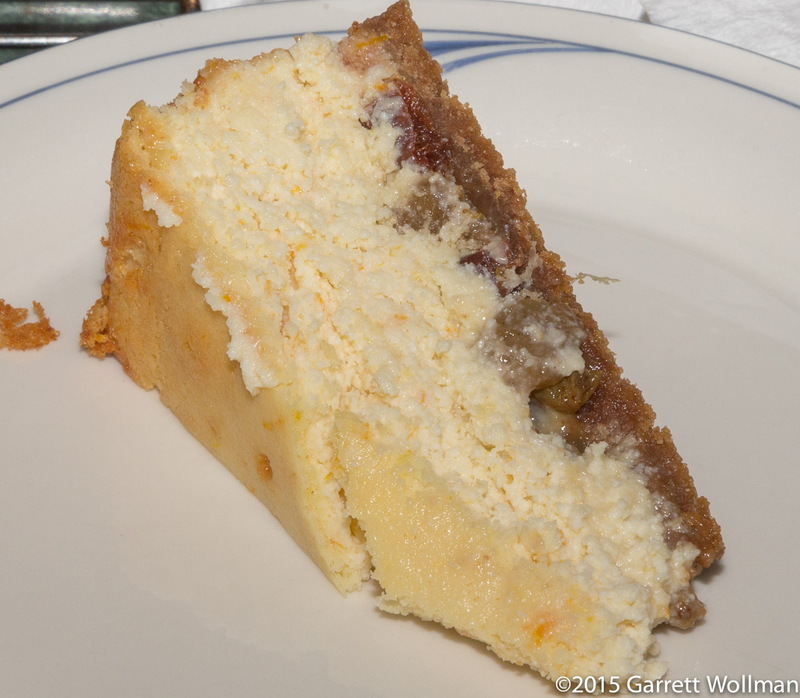 You can see that the texture of this cheesecake is not as smooth as a cream-cheese cheesecake; I’m not sure how much of that is inherent in ricotta cheesecakes generally, as opposed to my own flaws in execution. 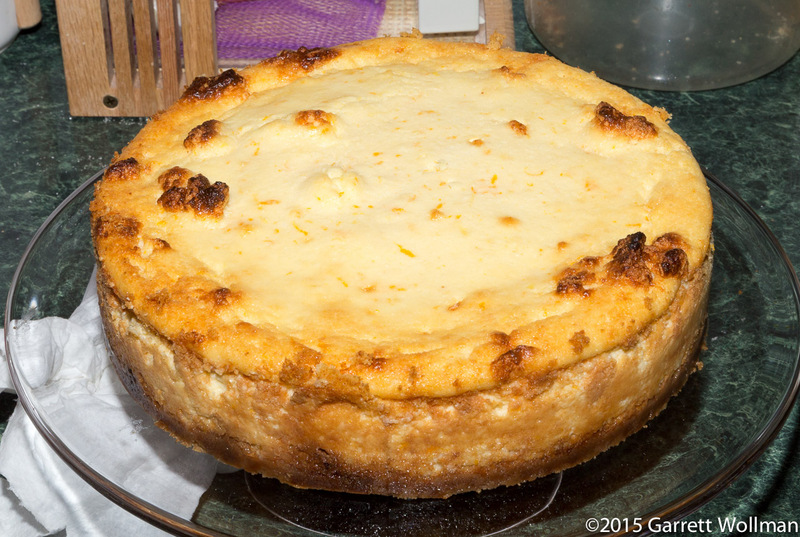 Gallery | This entry was posted in Food and tagged cheesecake, Emily Luchetti, recipe, ricotta. Bookmark the permalink.